Meet Smasher, the first human member of the IMPERIAL GUARD and an Avenger. Watch as the Avengers travel across the galaxy to fight off an invading force. Watch as the Imperial Guard are broken on a dead moon. Cover- Absolutely gorgeous! Smasher the earth based imperial guardsman literally smack dab in the middle of both her peaceful farm life on earth and high adventure in space! Art-Adam Kubert at his very best, captivating best describes what he’s done in this issue while the gorgeous colors take his art literally to the next level. Emotion- It was touching and heartwarming the exchanges the new smasher had with her grandfather. 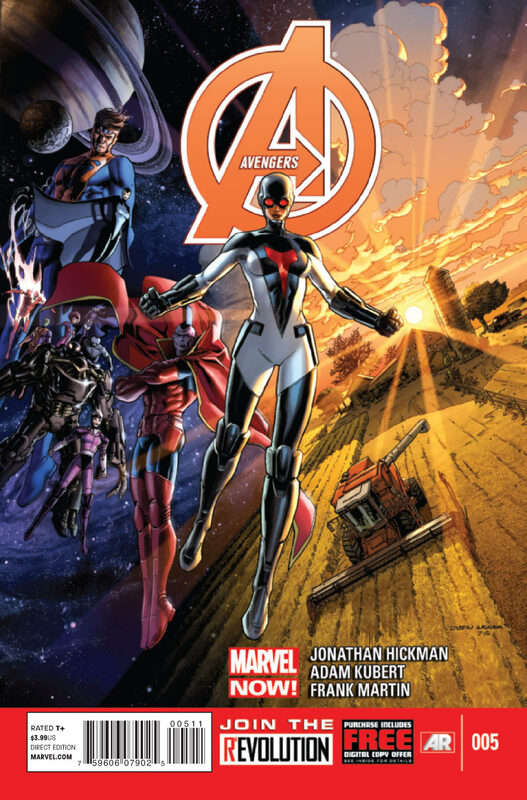 Black Heroes- New Adam, Sunspot, Falcon and Manifold make an appearance though they are all in supporting roles this issue. Origin- I like the set up for the new earth based smasher’s origin, in particular it references my all time favorite X-men run; the Grant Morrison era!